The new robot will also be able to cross water obstacles and climb on 150 mm stones and fallen trees. In mid-January, the Scientific Troops of Russia's Federal National Guard Service (Rosgvardia) started developing miniature ground robots to uncover insurgent positions and pinpoint the location fortified points without being spotted. The robots are coming, just as many sci-fi writers predicted. The Russian army will soon be exposing enemies with portable miniature electronic “commandos” on wheels that can travel across water (from a small puddle to a lake 100 m wide) and climb obstacles 15 cm tall. Based on the KRMM-06 robot, which looks like a large remote-controlled car, the new bots will carry out reconnaissance operations using an upgraded modular system - so they will also be able to perform specific combat missions. They will be decked out with cameras, thermal imagers, sensors, and alarm equipment depending on the nature of each assignment. It’s a small all-terrain, six-wheeled vehicle powered by an electric motor - its speed doesn't exceed five km/h. Fully equipped, it weighs about 25 kg and easily fits in a soldier's backpack. It’s an ideal reconnaissance device popular not just with special-purpose units, but also with sappers who use engineering robots on a daily basis (see this Russia Beyond article). The KRMM-06 system, which scientists and technical students are upgrading for the Rosgvardia's reconnaissance forces, is now being used by the Engineering Troops. The robot sapper is able to plant an explosive charge weighing up to 1.5 kg. "There are different types of mines. Once planted, some of them cannot be disabled and safely removed from their location. Charges of this type have to be blown up on the spot by less powerful charges. Essentially, in order to eliminate losses to personnel, the military uses robot sappers to install such bombs," professor Vadim Kozyulin, from the Academy of Military Sciences, told Russia Beyond. 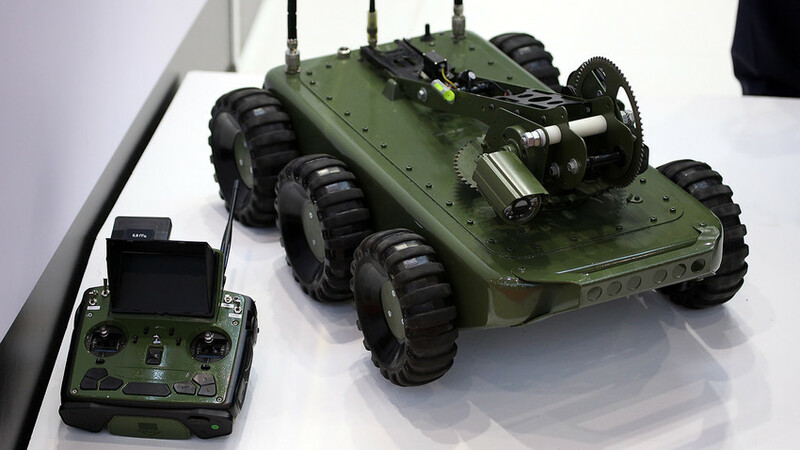 According to the expert, the KRMM-06 robot sapper can operate at a distance of 200 m from the user. The human sapper can see what’s happening through the robot's eyes on his computer in real time. It also has a two-hour battery life on a single charge. "After the upgrade for the reconnaissance forces, the robot will be able to enter enemy bases unnoticed by sentries and transmit information back to HQ.. It will be able to identify enemy firing positions and report on the number of insurgents, while at the same time plant an explosive charge. It’s a sort of mini saboteur," Kozyulin summed up. He said one robot sapper costs about $10,000 but it’s not yet clear how the price will change after the upgrade for the reconnaissance forces.